For 4 days and 3 nights, you will be able to explore Denali National Park from air and land. K2 Aviation, a National Park Service Concessionaire, and Alaska Alpine Adventures, a Commercial Use Authorization holder, are partnering to bring an extraordinary experience to visitors wanting a unique experience in Denali National Park. The beautiful flight from Talkeetna will take you to Moraine Lake inside the National Park near the Ruth Glacier. Throughout the trip, your guide will talk about the geology, biology and history of the area and teach you skills needed for off-trail hiking. You will learn about Alaska and the wilderness as you enjoy the peace and solitude of this stunning National Park. You will need to bring your own outdoor clothing and personal gear. A complete list of required equipment will be provided. Tours may vary according to weather conditions. We’ve been flying for over 50 years and operate a safe reliable service. We combine groups to ensure minimum if requested. Denali is America’s quintessential National Park. With over 6 million wild acres, the tallest peak in North America, and countless rivers and glaciers, Denali National Park lives up to this title as America’s crown jewel. While most visitors experience the park via its main northern corridor, the Denali Park Road, the south side of the park sees little annual visitation and remains completely road-less and virtually unexplored. Accessing the park by bush plane, your first treat will be a phenomenal flight around the Ruth Gorge and Denali. 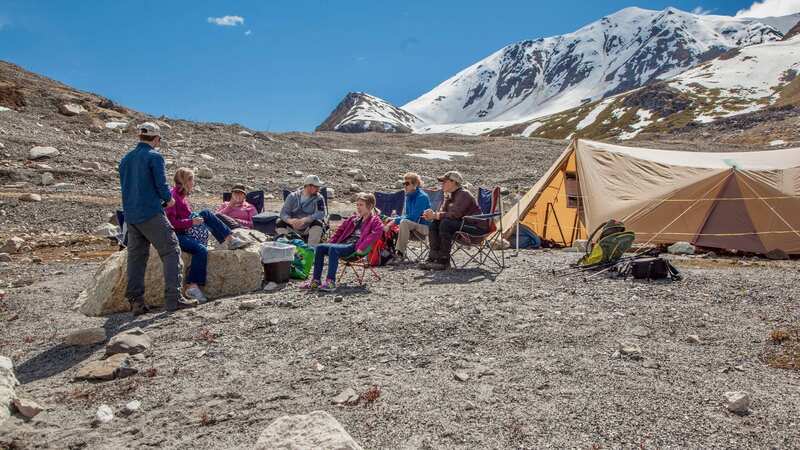 You’ll then spend 4-days and 3-nights camping and hiking Denali’s wild side from the comfort of our wilderness basecamp situated on the edge of the mighty Ruth Glacier, and only 17 miles from the summit of North America’s highest peak. This exclusive wilderness camp, on the shore of a small lake, puts you right in the epicenter of the Alaska Range and in a place where you will feel humbled by the scale and majesty of Denali National Park. With a light daypack, you’ll spend your days hiking miles of vast tundra and exploring the seemingly endless glaciers; returning to camp each evening for a delicious lakeside feast under the midnight sun. See Denali in a way that few ever have. See Denali unexplored. Will Mosquitoes Be a Problem? The number of mosquitoes is greatly dependent on hatching season and annual weather conditions. While we are bound to encounter some mosquitoes during the course of our adventure, their numbers have not presented major problems on past trips. That said, please arrive prepared with insect repellent and a head net to fend off any insects. All food has been packaged to minimize odors – we vacuum seal most of our fresh ingredients and sauces, we pack our food in bear resistant food canisters, and we store our food well away from camp. We make noise when we’re hiking in thick brush or windy conditions to minimize surprise encounters. We keep a clean camp. As a last resort, we travel armed. Our guides carry 44 magazines for shotguns. Most of Alaska’s national parks, excluding Katmai and Denali, allow for the use of firearms and our guides are thoroughly trained in firearm use. Again, using a gun is a last resort. Thankfully, we’ve never had to call one into service on a trip. Our food is excellent – something that clearly differentiates us from our competitors. We have spent the past decade fine-tuning our backcountry menu. Breakfasts include pancakes, scrambles, various homemade granolas and cereals, French pressed coffee, assorted teas and hot drinks. For lunch, we enjoy foccacia sandwiches, bagels and Alaskan lox, hummus and toasted pita chips, and assorted wraps. We also have homemade snack mixes both salty and sweet, and energy and candy bars available throughout the day. Dinners include lasagna, pad thai, beef mole’ tacos, penne pasta with a roasted red pepper pesto, and wild mushroom risotto. Last but not least, we ALWAYS enjoy one of Derek’s home-baked desserts after dinner. When Do You Require a Deposit, and How Much? We require a deposit of $1000 / person to officially reserve a trip. The deposit is due as soon as you’d like to book. That way, we have the trip inked in on the schedule and can begin the effort to coax others into joining the adventure. 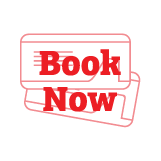 When you decide to book, we then generate an invoice that we send by email. You’ll have the option to pay the deposit by mailing us a check, calling us with a credit card number, or by using a Visa, Master Card, or American Experss with our secure online payment system. Do I Need Trip Insurance? Can I Buy It Through You? Our trip-partner Alaska Alpine Adventures is licensed to sell Travel Guard – an industry leading insurance product designed specifically for adventure travelers. Please contact us for details or a quote. All bush flights, both into and out of Denali National Park, are included in the cost of your adventure. For most of you, this will likely be your first trip in a bush plane, and a memorable one to be sure! This 1 hour scenic flight will take us over alpine tundra, braided rivers, and cascading waterfalls; past Denali, the highest peak in North America; and finally, down through Ruth Glacier and Great Gorge, the deepest trench on earth. Our skilled bush pilot will take us down to a lake nestled between the Ruth and Tokositna Glaciers, where we will unload our gear and wave the airplane goodbye. This is a wilderness camping trip; you will be sleeping in expedition-quality tents for the 3 nights in the Denali wilderness. You will have the choice of a single, double, or family size tent, which is capable of sleeping 2 adults and 2 children. You will need to bring a sleeping bag rated for 30°F or warmer, as well as a sleeping pad (details below). We will also have a group tent for eating, relaxing, and getting out of the weather. Our camp is comfortably provisioned, but is still a wilderness camp; there will be no hot running water, beds, or cabins. Your trip originates in Talkeetna; we’ll meet as a group for a morning hike at K2 Aviation to brief. As you prepare for your flight, your guide(s) will be available to aid you with your gear and answer any questions you might have. We’ll load up and begin our flight into the wilderness by floatplane. Our first afternoon in camp will allow us to get our bearings, take in the surrounding beauty, and get a feel for the terrain we will be covering. You will quickly become acquainted with our style of wilderness travel and camp etiquette. Meals are planned to be sumptuous, filling culinary adventures of their own. Because weight and packaging is critical, careful consideration is taken in planning and packing the ingredients. We use organic and real food products when possible and the very best freeze-dried and dehydrated ingredients available. A deposit of $1000 / person is required to reserve a trip with Alaska Alpine Adventures. The remaining balance is due 60 days prior to the start of the trip. Reservations made within 60 days of the trip’s starting date require payment in full. If the participant cancels a reservation earlier than 60 days prior to the starting date, the deposit will be refunded, with a $500 administration fee. If the participant cancels within 59-31 days of the starting date, 50% of the trip’s balance will be refunded. If cancellation is made within 30-0 days of the trip starting date, any payments are considered forfeit. Alaska Alpine Adventures recommends cancellation insurance, available through Travel Guard.